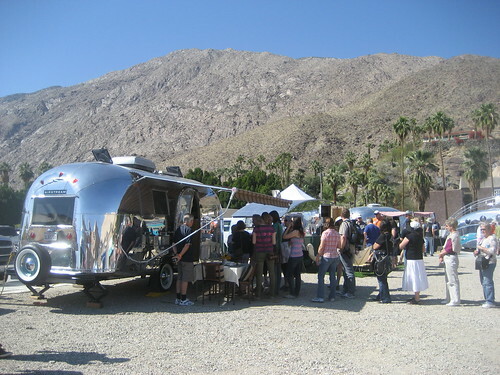 The closing weekend of Palm Springs Modernism Week featured two days of vintage airstream tours. Dozens of people hauled their restored travel trailers here for us to line up to take a peek inside at their handiwork. The Decoliner looked like it landed here from another planet. (It was Oregon, actually.) 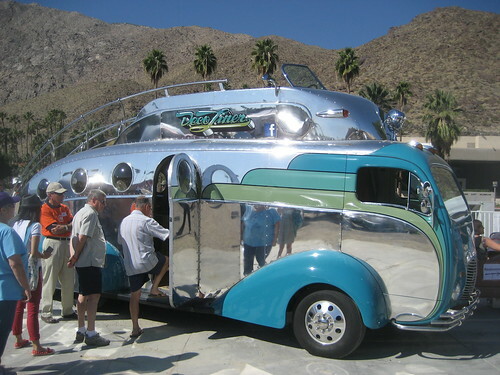 Randy Grubb builds amazing custom cars — Jay Leno bought one — and he made this beauty in 20 months with the front cab of a 1950 COE, 455 Oldsmobile engine, and 1973 GMC motor home chassis. The inside of it was just as groovy. Those little windows are part of the stairs that lead up to the flying bride. That’s right, you can drive it from the top. Each trailer had its own unique style. 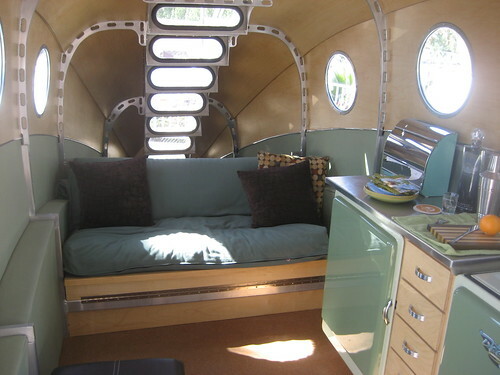 One of my favorites was this 18-foot-long 1964 Airstream Bambi Two, probably because it reminds me of an Anthropologie store. 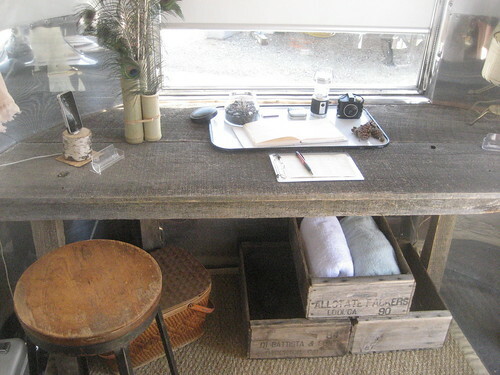 The design was inspired by the Sierra Foothills and the modular furniture was made from salvaged local wood. Owner Kristiana Spaulding rents out the trailer for commercial shoots and special events, plus she designs jewelry featuring (what else?) trailers. 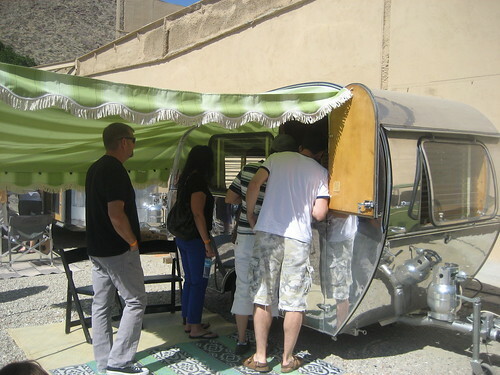 We also saw other airstream enthusiasts turning their passion into businesses by selling themed magnets and t-shirts. 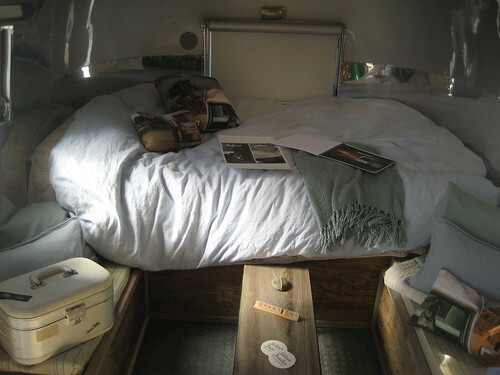 It’s so easy to admire these shiny symbols of the open road (with a few of the comforts of home). RV connoisseurs would have been excited to see this rare (so I’ve read) 1965 Dethleffs Beduin, but I was more thrilled with what I spotted inside. 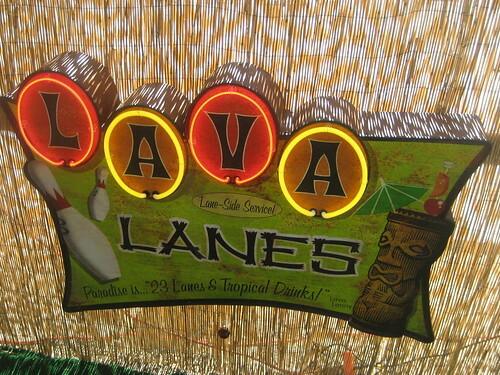 There was a retro tableau set up in the dining area, complete with ceramic tikis. They looked great with the tropical plant print on the seats. You summed up the vintage trailer show wonderfully! What a great event that was. 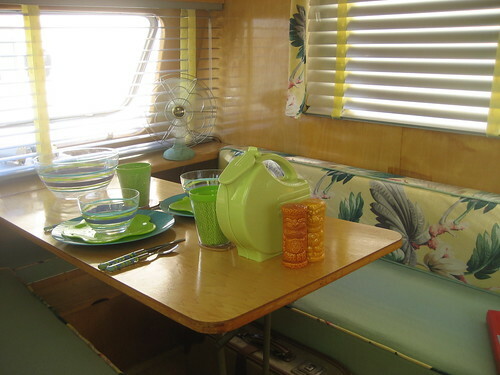 I’m flattered that you mentioned Betty Jane, my Airstream Bambi II. I know I’m attached and I’m so glad you like her too! Thank you for the shout out. Thanks, Kristiana. Betty Jane is a beauty!